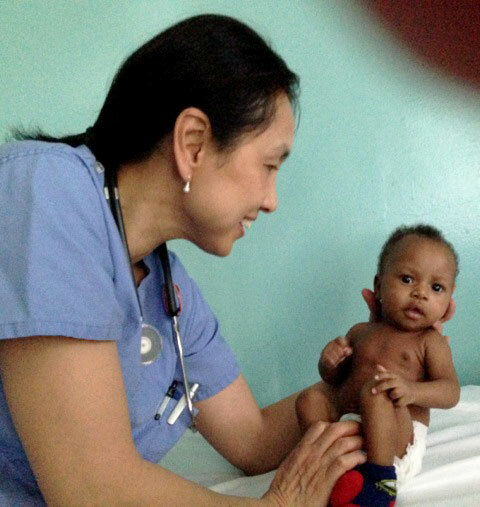 A group of Akron Children’s doctors, nurses and staff travel regularly to Haiti to help care for the sick children at St. Damien Pediatric Hospital. This post is the last of a 3-part series by Dr. Grace Smith, who gives a first-person account of her most recent medical mission trip there. Read Part 1 and Part 2 of the series. The second day started much like the first. We attended mass with the other medical workers. Father Rick, who is also a physician, led the service in a small, open-air stone chapel. We sat on wooden benches at the perimeter while 3 cardboard coffins holding deceased children from the previous day lay on the floor draped by a blanket. 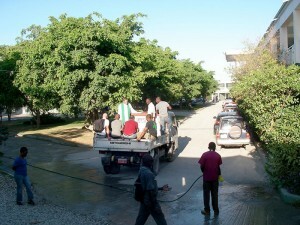 After singing hymns, 2 of the coffins were respectfully hoisted up and carried to the waiting pick-up truck. From the middle coffin, Father Rick gently lifted 2 tiny bundles wrapped in plastic, and cradling one in each arm, followed the procession. 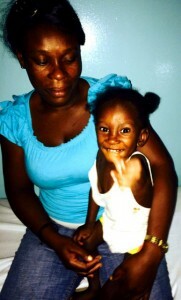 When we arrived to the clinic, there were already patients in the waiting room. We had an established routine from the day before, so Carson grabbed the stack of charts and quickly went to work. The first 4 patients were from the ward. The first baby had heterotoxy syndrome, a condition where the heart is malpositioned in the chest and the abdominal organs are switched. The heart chambers, great arteries (aorta and lung artery), and major veins are misconnected due to a signaling error in heart development, much like a malfunctioning traffic light misdirecting west bound traffic eastward, and vice versa. Figuring out the anatomy is like untying a knotted fishing line. It takes time, which we didn’t have. Out of the corner of my eye, I noticed Carson quickly stacking patient charts he had triaged, with the sickest ones on top. As I reached for the next chart, he stopped me and said, “We have to see THIS girl next,” thrusting a chart in my hand. “Her pulse ox (oxygen saturation) is 20-30% and she’s gasping in the waiting room,” he said. The pulse oximeter we had was old and had been loaned to us from the ICU. It didn’t have a child/infant probe so I was doubtful. We brought her in. She was a 3 year old from the mountains. She was lethargic, gasping and her lips were profoundly blue. We laid her on the bed and started scanning. She has a condition called Tetralogy of Fallot, where there’s abnormally thickened heart muscle under the great artery to the lungs. When she plays vigorously or gets agitated, the obstructing heart muscle spasms, cutting off blood flow to the lungs. She then hyperventilates, frightened and gasping. The oxygen-deprived brain causes the child to become somnolent or even lose consciousness. This is a “Tet-spell,” a frightening event for parents to witness. Carson had never heard of Tetralogy of Fallot but had recognized a hypercyanotic spell. Once she fell asleep and was breathing evenly, her pulse ox rose to 77%, which I suspect is her baseline. I worry about adding her to our surgical list for fear that she may be too unstable to travel by air. Bringing patients to the U.S.
Last year, one of the patients we selected to bring over for surgery had a hypercyanotic spell on the flight to the States. Fortunately, he came out of it, thanks to Drs. Jeff and Ellen Kempf – a pediatric emergency physician and pediatrician, respectfully – and my partner, pediatric cardiologist John Clark. Parents can’t accompany their child to the U.S. for heart surgery. 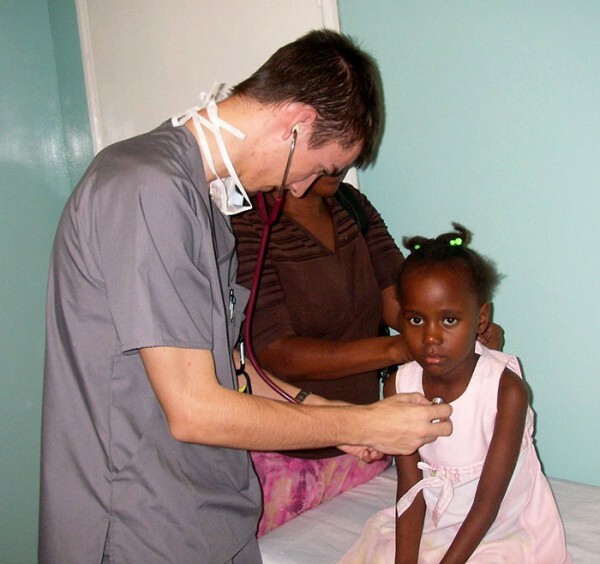 Instead, a hospital translator travels from Haiti with the team. Once the child leaves the parents’ arms, the accompanying physicians become their surrogate parents. The child lives with the physician’s family for the duration of their visit to the States. For the first week or 2, one of the goals is to get the child accustomed to a normal caloric diet so he’s out of starvation mode going into surgery. It takes a while for the child to get used to our “strange” American diet. Better nutrition before surgery will lead to faster wound healing and smoother transition out of the critical care unit after cardiac surgery. One Haitian child, who was tiny from chronic malnutrition, initially refused to finish her American meals, instead pocketing half of the food from her plate to take home to her mother and sisters. Around midday, a tiny, frail baby was brought in, breathing rapidly, arms and legs as thin as a sparrow’s. Her mother and a young pediatric resident from the Czech Republic had traveled 5 hours on buses to bring her to our clinic. The baby had arrived at their medical outpost 4 weeks prior, pale, swollen with an excessive accumulation of fluid (edematous), and struggling to breathe. 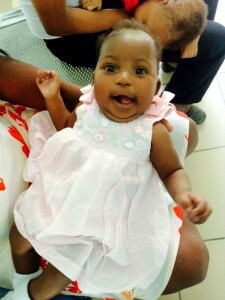 The pediatrician gave her furosemide, a diuretic, kept her for a week, and then sent her home. Three weeks later, mother brought her back, again gasping and edematous. An X-ray showed “wall-to-wall” heart. They suspected an absent spleen. It turns out her heart only has 1 pumping chamber instead of 2, with misconnected great arteries and veins. For a brief few seconds, I imagined this baby born in Akron, Ohio, where our team would discuss procedures like cardiac catheterization, MRI, surgical shunts and staged cardiac palliative procedures. After explaining the details with the pediatric resident, I turned to the mother and told her that her baby had a complex heart problem that, unfortunately, cannot be fixed. We will recheck her in 6 months. Sadly, I doubt the baby will survive that long. Before leaving, the pediatric resident smiled and shyly pressed a folded paper in my hand. She asked if I would mail the letter to her family in the Czech Republic when I got back to the States. The day grew hotter. We had to work faster. The 4 add-on patients had taken up most of our morning. I gave up looking through old charts. I admitted defeat because I can’t read French, especially cursive. I suddenly wished we had Epic (Akron Children’s electronic medical records system) and almost laughed out loud. Irony is not my friend. Father Enzo asked me about a 7-year-old girl I had seen the day before. Father Enzo is in his 30s, with dark curly hair, kind eyes and a perpetual smile. He lived in Pittsburgh as a child. He was concerned about Alcineous Frantzberly, a sweet girl with rip-roaring rheumatic fever due to strep pharyngitis 9 months earlier. Before the discovery of penicillin, rheumatic fever was common in the U.S. Crowded living conditions promoted the transmission of Group A beta-hemolytic strep (strep throat). In certain vulnerable individuals, the streptococcal organism not only causes a sore throat but results in an intense inflammatory response in which the body’s immune system attacks the heart valves, especially the mitral valve. This causes the delicate, paper-thin leaflets to become thick, rolled and gnarly. The fine chordae that anchor the valve may disintegrate, causing the mitral valve to flail wildly in the heart like a parachute with severed cords. The leaky mitral valve results in an enlarged left atrium that presses on the adjacent small airways. The child coughs and wheezes with activity or lying down, a condition described in old textbooks as cardiac asthma. Father Enzo used to visit Alcineous on the ward when she first came to St. Damien’s. When Alcineus was finally strong enough to walk, she would find her way downstairs to Father Enzo’s office and stand quietly at his door until he waved her in. Alcineous would crawl into his lap, watch him work on his computer, and fall asleep in his arms. He would carry her upstairs to her bed and tuck her in. This went on for 3 weeks. He had become as attached to the frail girl as she was to him. He had hoped her heart condition could be fixed surgically. Father Enzo made cappuccino for us and invited me to sit. Alcineous perched on his lap. Her mother was there as well. I took a deep breath and slowly explained that her daughter’s mitral valve was badly damaged. It was likely her entire valve would need replaced. Even in our state-of-the-art cardiac surgery center in Akron, Ohio, mitral valve replacement is not a simple undertaking. The risks are high, compounded by the possibility of clot and stroke after surgery. For the rest of her life, Alcineous would be on a blood thinner. And because the implanted valve doesn’t grow, it would have to be replaced periodically. The girl smiled back and kissed him on the cheek. He leaned her toward me and she kissed me. 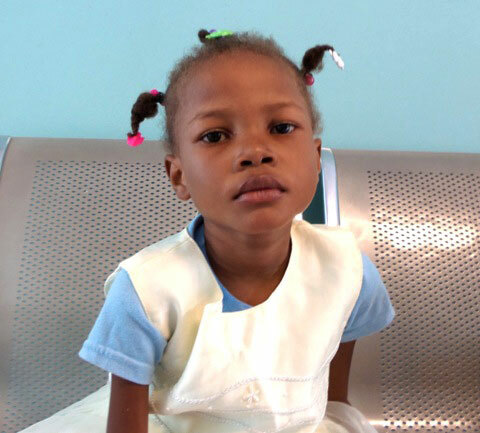 Lamely, I suggested Alcineous come back in 2 months when my partner, Dr. John Clark, would be returning to Haiti to finalize the list of surgical cardiac cases to be performed on site at St. Damien’s. It was dark when we said goodbye to our translator David. It takes him 1.5 hours to get home. He has to take 2 or 3 different “tap-tap” trucks – Haiti’s version of Uber, so named by tapping the brightly colored taxi-trucks to get on. When Carson and I finally closed the laptop at 11 p.m., we were in a foggy haze, munching pretzels and fighting to stay awake. We talked about what we had seen. He asked questions. I knew this place had made an impression on him. Carson had worked 18-hour days for the last 2 days, functioning essentially as a fourth-year med student or intern. He was tired, but had found it exhilarating, as I did. Carson will make a fine physician someday, no matter what field he chooses. We were done. It was time to pack things up and fly home. 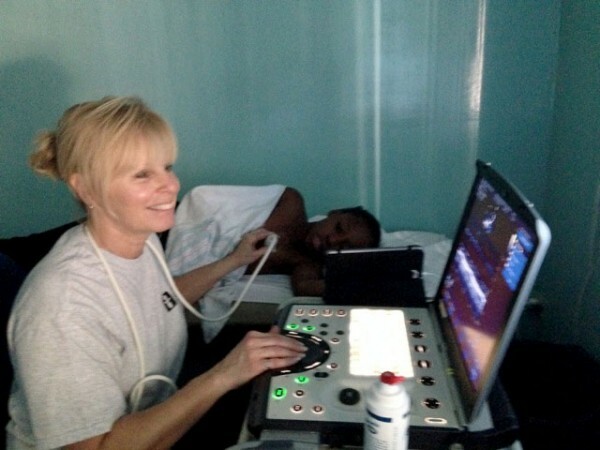 Special recognition goes to Diane Momchilov-Beuker, our echo-sonographer, who had a smile on her face all 3 days. Undeterred by heat, long hours, struggling children, and complex anatomy, Diane did all the heavy lifting to ensure the success of our trip. Additional invaluable support came from my partners Drs. J.R. Bockoven and John Clark, and Drs. Jeff and Ellen Kempf, the anchors of the St. Damien and Akron Children’s alliance.